This pretty pink pendant enhancer will always be in style. 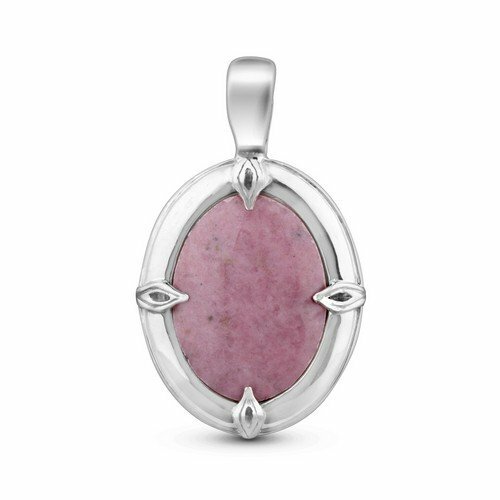 A genuine pink rhodonite cabochon rests in the center of highly polished sterling silver for a look that's smart and simple. This versatile piece can be dressed up or down and adds a delicate hue to your everyday wear. The enhancer features a sterling silver snap hinge bail. *Note: Color may vary due to characteristics of the natural stone. Our jewelry is proudly made in America with US and imported parts. We do our part for the environment by crafting our jewelry from recycled .925 sterling silver. Low priced Sterling Silver Rhodonite Statement Pendant Enhancer is what i was looking for, great store! Probably the lowest price for Sterling Silver Rhodonite Statement Pendant Enhancer available in a lovely webstore!